Measures like P/E ratios are relics of days long past. Today, we have more robust data and can more easily detect distortions. To outperform benchmarks, investors can use more meaningful measures. When broadsheet newspapers were the source of market data, Price/Earnings per share (P/E) ratios were a one-column summary of value. The number showed how many periods of earnings per share (EPS) were needed to cover the purchase price. These weren’t true then or now. Over time, limitations of the P/E became clearer and improvements offered. For example, it helps to be forward-looking. For more on complications and improvements see, Market value – why P/E might not be what you think it is. Yet, tweaking the “E” wasn’t enough to fix the problem. Investors still needed better insight to fundamental value. This is in contrast to traders who use P/Es for psychological or technical purposes, unrelated to fundamentals. 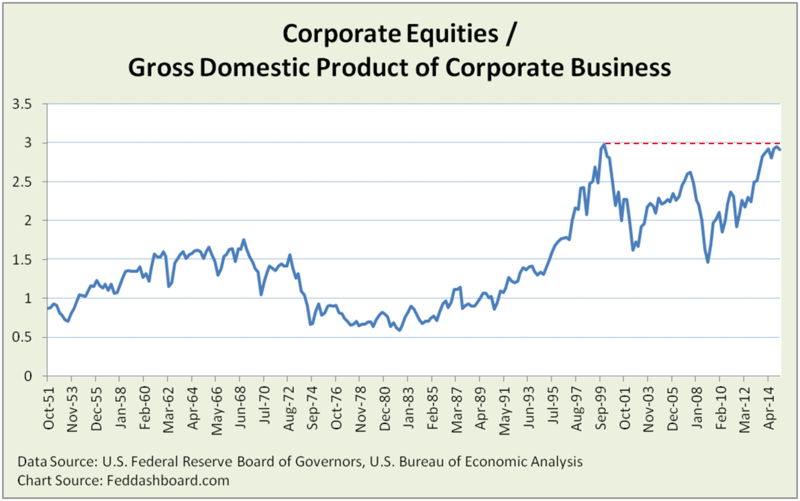 To help overcome several of these problems, the Price to Earnings to Growth (PEG) ratio was created in the 1960s. 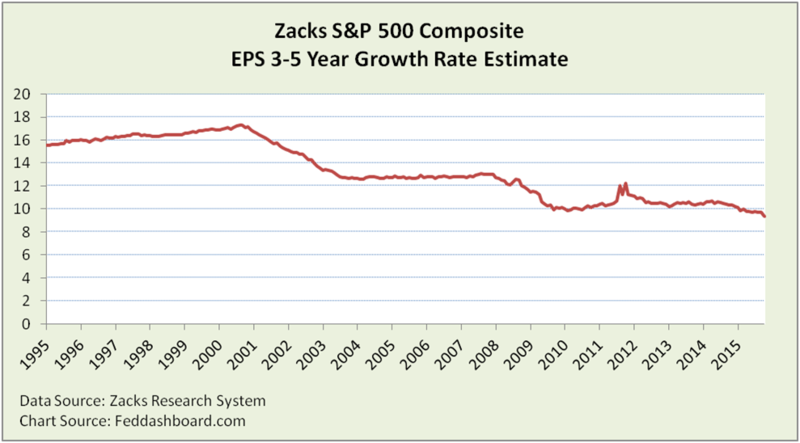 This starts with the P/E ratio and then divides it by the expected 3-5 year EPS growth rate. Yet, it still assumes a constant growth rate for each company. The PEG is convenient to read. A measure of less than one implies analysts expect future EPS to grow faster than current EPS — thus the stock is undervalued according to its P/E. The PEG (red line, right axis) is at a lofty all-time high. 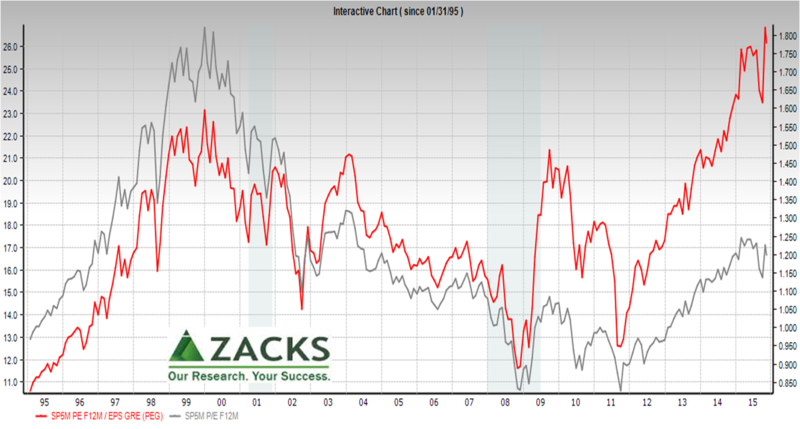 The P/E (gray, left axis) is at a 10 year high, but well below its dot com bubble peak. Poking at the PEG, we uncover a reason for its all time high – low expectations of 3-5 year EPS growth, from consensus estimates that are usually bullish. The P/E, PEG and return ratios all suffer a shared problem in comparability over time. Why? Debt prices have also been affected by lower interest rates. To help overcome limitations, watch business model fundamentals at the “tree” level and the Strain Gauge “forest” view. The Strain Gauge is near all-time highs.